People of Panaji obvious have immense love for goan food, which is the native food of state of Goa. The goan food is heavily influenced by unique geography that Goa finds itself in. With its innumerable beaches and tropical climate, obviously sea food is an integral part of goan cuisine and use of spices in goan food is really immense. Besides, the rich history of Goa, which is deeply steeped in the rich legacy of Portuguese Empire, also has a very deep influence on goan food. Below is a brief roundup what really makes up a typical goan dish. Goan food is obviously incomplete without seafood. It has been an integral part of goan people’s basic staple since time immemorial. This is all thanks – as mentioned earlier - to innumerable beautiful beaches that Goa is so much blessed with, invariably making fishing and sea food a very booming industry here. As matter of fact ‘fish’ is one sea food item that is cooked almost every day or alternate days in every household of Panaji and also rest of Goa. 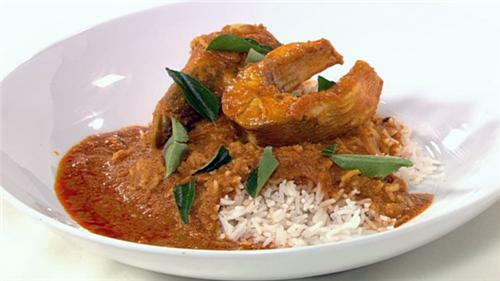 The most popular fish dish items in Goa are Goan Fish Curry, Goan Pawn Curry, Fish Suke, Prawn Masala, Dry Prawn Kismor, Fish Balchao, Fish Mayonnaise, Visvan Fish and many others. Apart from fish, other sea foods that are immensely popular in this part of the world are lobster, squid and mussels. In case if you’re a tourists visiting Goa, then you can relish all these food items at innumerable Goan restaurants in Panaji city. Besides, even general restaurants in Panaji city serve sea food. Goa has unique distinction of having highest number of Catholic Christian population in entire India. Catholic Christianity came and spread across Goa during 450 year rule of Portuguese Empire. And it was indeed during four centuries of Portuguese rule that unique Goan Catholic Cuisine began flourishing, which today has become an integral part of Goan cuisine and food culture here. Besides the obvious Portuguese influence, catholic cuisine also bears the influence of South Indian cuisine. Here are names of some famous goan catholic dishes, which are today basic staple of goan people. Balchão: A spicy curry made from shrimp, aguardente, laurel, lemon and chili. Chamuça: A very unique Goan samosa. 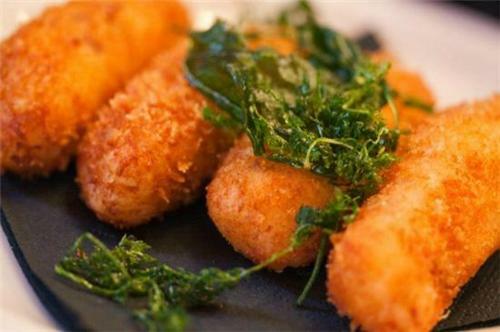 Corquettes: very popular snack in Goa. It is actually combination of beef cutlets and beef potato chops. Xacuti: A very famous Goan curry made with roasted grated coconut. Sanna: This is actually a type of idili, which is only popular in Goa. Solantule kodi: This is a type of curry made with help of coconut and kokum curry. Bebik: This is actually a pudding, prepared usually during Christmas period. Besides all the above mentioned dishes, Rice is another item that is one of the basic staples of Goan people. And when it comes to what ingredients do Goan people use while preparing their daily dishes, then use of coconut and various local spices that are found only in Goa are used immensely. In fact the use of spices is very important in Goan dishes, as Portuguese had transformed Goa into thriving market for spices, which invariably gave local people access to various kinds of spices. Overall, the Goan food has carved its own unique identity in the vast world of Indian cuisine. Since it is probably the only type of Indian cuisine that brings a sublime combination of Indian and European taste.